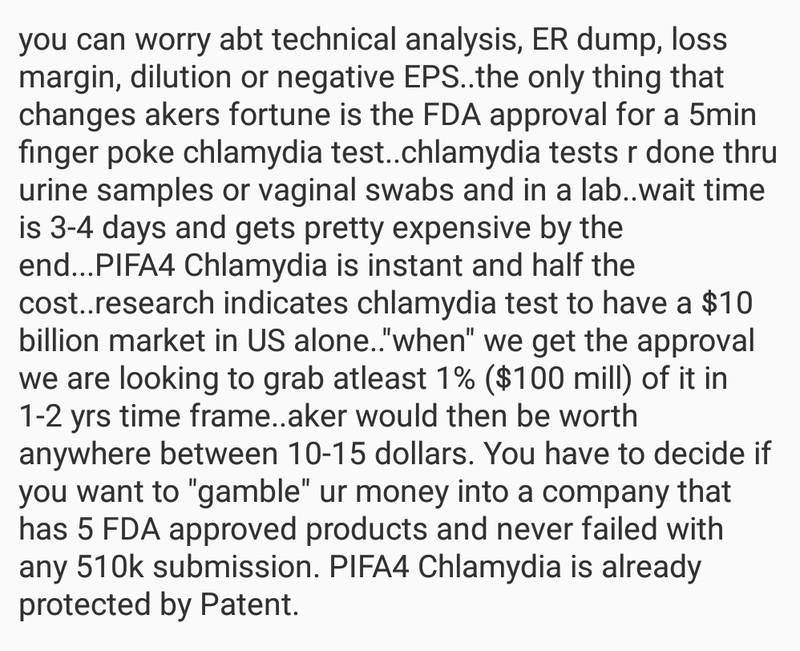 @Ashleys_Trades I could not say it more better than this about AKER. Candlesticks mean nothing. Revenue is going to blow up. @Hikaru, I've been watching AKER for quite some time now and even decided to do some paper trading with it once you stated this. But until I see bigger price movement that makes me more confident in the stock, I decided I am only out for small wins. Maybe this will be the next big thing, but I am not a long term investor and for now, short term is what I'm comfortable with. congrats. But don't let $100 or $1000 derail you from making a lot more. by that I mean don't think in a tunnel. play long if you know the payload is there. This is not the way to play stocks. Just think harder, not ride the wave in and out. Read up on what the catalysts are and know how big it is. 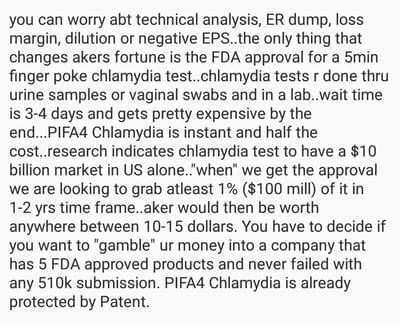 FDA approval on Chlamydia is going to be huge for AKER. Over $1 guaranteed. So had you hold it, that's easy 50% profit. I appreciate your input and I will definitely look into understanding the valuation. I am just trying to get a grasp on what works and what doesn't at the moment and I am studying a little every day. I hope to be really good at this one day and I encourage all types of advice. Try holding and understanding the company. AKER is at a great buy price now. NVCN JAGX AKG...what's the big deal with those? Market uncertainty, chaos random volatility and trend: Market behavior can be erratic short term due to politics among other things thus creating short lived spikes or plunge, later corrects itself to its intrinsic state. Or I&apos;d like to call, their state of equilibrium. The intrinsic value that collective herd judge what it&apos;s worth. Valuation is often distorted due to economic events . Profits can be made when a business valuation gets distorted due to harsh sell off of harsh buy out. Pretty much like when a holding company going bk n has to fire sell all assets to pay debt. Opportunity lies in those circumstances. That's what i call Valuation and one of my key metrics for trading. Put a value on the company and determine if it's below value or over valued. Thanks for the "food for thought". First, you are right. Looking back, we see some wellknown stocks and their impressive long-term returns. BUT, you just don't know it when these companies are starting out. There are quite a few examples where similar stocks rose impressively and then with one bad announcement or a better competitor, the stocks tanked 80%. Most long-term investors have no exit plan. But day and swing traders do. Instead of just "hold and forget", it can be more lucrative to sell all or most of the position into spikes and enter again with more shares (with the profits gained from the spikes) on dips or retracements. This way, the long-term traders/investors are more in control and can compound profits. At the same time, this kind of swing trading strategy would make people more aware of the overall market and the individual stocks, which could prevent them from experiencing a major loss. Selling and re-entering is a good play if you can predict events. 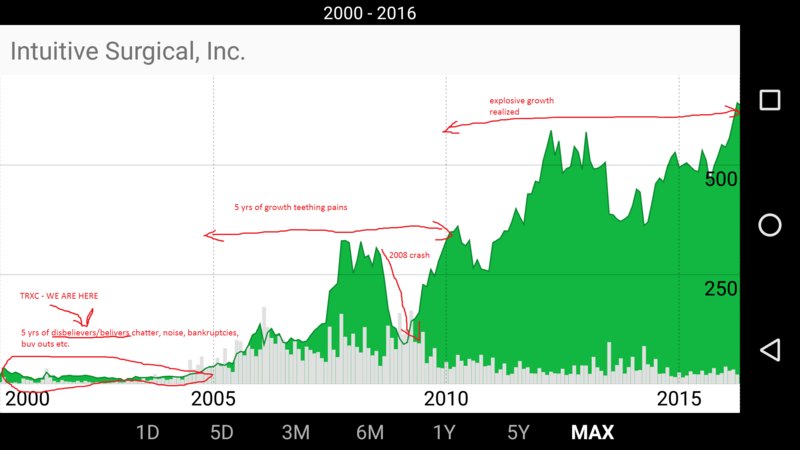 Selling too early and leaving the stock if the company has a lot more fully peaked is bad. I am reminded my sell of NVDA at $33. Lesson to be learned from day trading! You have to monitor their business. Are they improving ER or declining. Sometimes you need to just have some faith and let them do their thing. When you smell something bad then pull half out or close position. I have a call option on it! Whoops sent that too early the perils of using my phone for profitly, this is still speculative I saw your piece on this being a $40 bil company which it could. May just buy a few hundred worth of shares as a longer term play. Still would like some more news on their robotic surgery system and perhaps a nice contract win would really intice me. Currently a bit too speculative for my risk appetite will definitely keep an eye on this though 😀. The infancy of companies is always speculative. Facebook, Tesla, Google, Amazon, ISRG...they had to start from somewhere. That's why some people only touch "matured" companies while others pick early potentials like me. Perhaps a portfolio of mature companies and early startups is a good mix.